Spring has always been my favourite season which brings me longer days, warmer weather, lots of sunlight and numerous gorgeous blooming flowers after a long quiet winter. I woke up on a Saturday morning and decided to spend my day in Richmond. With my beloved camera, I wanted to document the changes occurring in the Royal Botanical Park when spring is here, in the air. 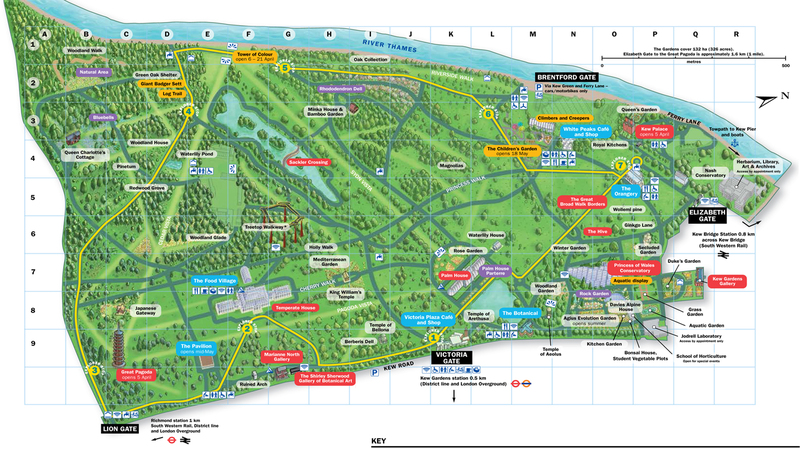 It takes around 18-20 mins from Waterloo to Richmond station by train, and the Royal Botanical Kew Gardens is just 14 mins walk from Richmond station. The visitor can buy entrance ticket at the gate or online through Kew Gardens’ website, click here for more information about the ticket. As a student, I just paid £9.00 for a ticket at the gate without a donation. If you are looking for a getaway from the busy London or a green spot for family-outing near Central London, Kew Garden is absolutely an answer to your concern. Kew Gardens is located in the South West of London – the beautiful neighbourhood of Richmond upon Thames, which is recognised as the largest UNESCO world heritage site in London opened more than 250 years old. There is the home of the Millennial Seed Bank, the biggest wild plant seed bank in the world. Moreover, the Kew Estate occupies an area of 121 hectares home to over 30,000 plants, where you can find many spacious flower and vegetable gardens, woodlands, lakes and ponds, conservatories, natural reserves and wildlife. From the Lion Gate, taking a stroll down to the North, you can see Temperate House which is illustrating collections of very rare and threatened species of plants. Some of the plants you will see here, have been extinct in the wild and only live at Kew, such as the Encephalartos woodii (The South African cycad). Plenty of cherry blossom, wax flower and magnolia trees are now in full bloom, so it would be a crime to miss out Kew Gardens in the must-visit-spot for seeing spring blossoms. Kew is also home to a stunning orchid collection of around 1500 species, which are featuring at the Botanical Conservatory. Just 3 mins walk from the Botanical; you can view an exotic selection of Mediterranean plants, mountain plants and moisture-loving species from all over the world. One of the extremely-fun-things to do at Kew is climbing to Treetop Walkway at the height of 18 metres (above ground) and 200 meters in length, which brings visitors an awesome experience to walk amongst the top of trees and enjoy a fantastic panoramic view over the garden. After a few hours walk around the Gardens taking my breakfast with Chicken Big Tasty at MacDonald’s away, I took a bus from Kew to Petersham Nurseries Teahouse for lunchie. A restaurant & tearoom located inside the nurseries is such a lovely and cosy glasshouse decorated with a lot of beautiful garden flowers and English style furniture. Most of the dishes are Italian inspired food using the very best of local and seasonal English produce. As I was not hungry, a plate of poached egg with asparagus, bottarga & pea shoots was perfect for me, while my friend had two-course meals: Tagliatelle with beef ragu, wild mushroom & parmesan and Haye farm chicken with roasted potato and vegetables. The combination of fresh ingredients worked beautifully that was refreshingly light and comforting — just the thing I want for a lazy lunch on the weekend. Another plus point for Petersham is its wine list which is extensive and impressive. As being a slow food restaurant, customers often long over 20 mins for their order, so are we. The restaurant gave us a plate of farm salad with parmesan when waiting for the food coming. The chicken dish was truly surprising me which was cooked to the perfect level with a crispy fried skin and juicy meat topped up some sauce. In England, afternoon tea is a quintessential activity you shouldn’t miss out. After finished the lunch, I ordered two teapots of Jasmine and Chamomile, as well as gave the Orange tart with goat cheese ice-cream and roasted orange slide and Petersham Amalfi lemon tart with creme fraiche a try. Then spending the rest of the afternoon to enjoy a lovely spring day with cakes, tea and flowers. Only 20 mins travelling from Central London by train, why not make Richmond your next weekend break? It’s worth spending a day in nature.